• Kudrjavcev, A. (2004) Biocontrol as a basis of phytosanitary stabilization of flax agriculture. Materials of international scientific and practical conference Biological plant defense is basis of agroecosystem stabilization (Krasnodar, 29/9/2004-10/10/2004) p. 236-237. • Kudrjavcev, A., Zaiceva, A., Zlotnikov, A., Zlotnikov, K. (2005) Increase of quality and yield of flax at using of biostimulant Albit for protection of flax. Materials of international scientific and practical conference Problems of increase of flax quality (Torzhok, 2-3/11/2004) p. 157-162. • Kudrjavcev, A., Zaiceva, A., Zlotnikov, A., Zlotnikov, K. (2004) Increase of effectiveness and safety of chemical means of plant protection through their combination with biostimulants. Materials of international scientific and practical conference Chemical method of plant protection. Status and perspectives of ecological safety improvement (St. Petersburg, 6-10/12/2004) p. 174-175., 2004. • Kudrjavcev, A., Zaiceva, A., Zlotnikov, A., Zlotnikov, K. (2005). 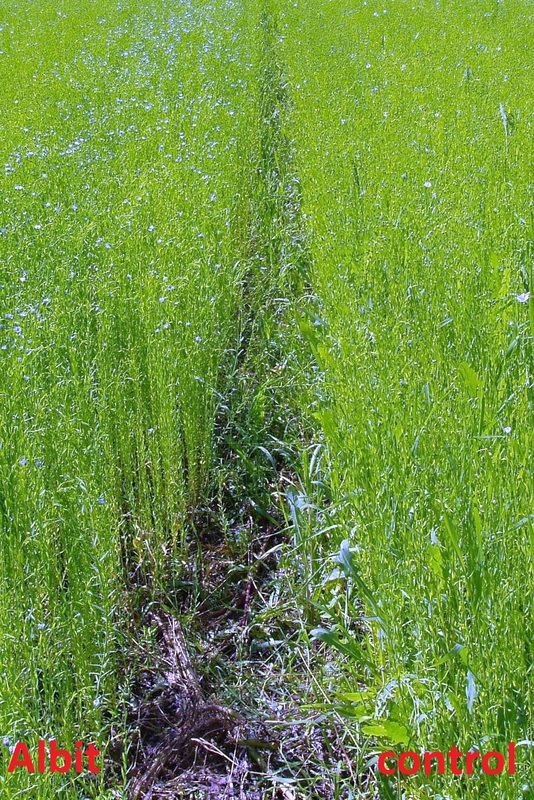 Biostimulant Albit as a part of flax protection system. Zemledelie, p. 34-35., Nr 1.,2005. • Kudrjavcev, A., Zlotnikov, A. (2004-2005) New pesticides for protection of flax. Agro-XXI. Nr 1-6. p. 25-26., 2004-2005. Influence of Albit on flax was examined in field trials in Pskov, Tver' and other regions carried by All-Russia Flax Institute (2002-2004), Pskov regional plant protection station (2002) and by other institutes and farms; also, there is long-term experience of practical application of Albit on flax in Vologda region by Vologda regional plant protection station and in Altaj kraj. Albit shown a high efficacy and is recommended for application on fiber flax and on oilseed flax. Also, Albit provides control of anthracnose (BE 40–90%), bacterial disease (BE 77–91%), mottle (BE 78–90%), pasmo disease (BE 70–90%) (Fig. 1). Albit officially registered in Russia as fungicide against these diseases. Fungicidal activity of Albit for flax is one of the highest among all examined agricultural plants; it observed for disease prevalence of 6-24% and (in this prevalence range) is able to protect flax not worse than chemical protectants and fungicides. It is recommended to use pre-sowing seed treatment (50-100 mL/t, application rate of working solution – 5-15 L/t) and foliar spay at the ‘fir-tree’ stage (BBCH 20-30, 50-100 mL/hа, application rate of working solution – 200-300 L/ha). A higher dose (70-100 mL/t) is applied against plant diseases. 50 mL/hа is optimal dose for fiber flax, 100 mL/hа – for oilseed flax. 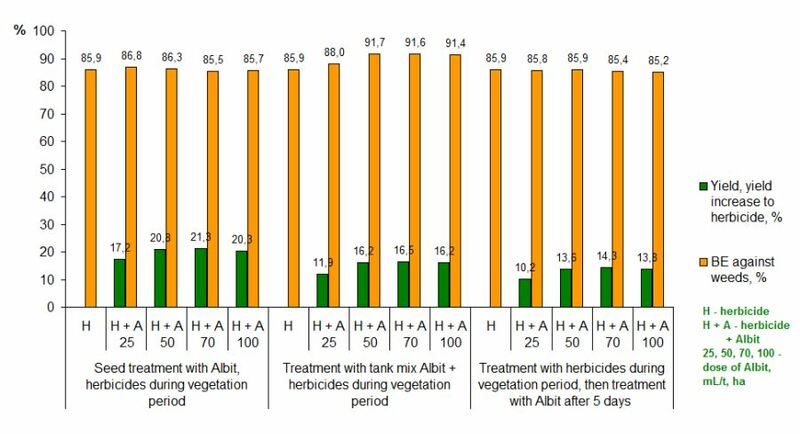 For removal of herbicide stress, Albit may be applied in tank mix with herbicides and after herbicide application (during 5 days). After Albit treatment amount of flax flea beetles was decreased. 1 litre of Albit can be used for treatment of 17.4 hectares of flax. Presowing seed treatment increases germination and germination power, provides great plant growth stimulation from very beginning of development, increase of resistance to unfavorable environmental factors, decrease of stress after herbicide treatment, increase of yield, improvement of crop quality (percentage and number of fiber), defends flax from diseases of shoot stage (anthracnose, mottle, bacterial disease, pasmo disease). At low and moderate level of infection, Albit can effectively defend plants itself. In case of high infestation one can use Albit with decreased doses of chemical fungicides. Albit is not a disinfection agent, but it can increase disinfection effectiveness of chemical means of plant protection. Addition of adjuvant (NaCMC, 0.2 kg/t) to working solution used for seed treatment is recommended. According to tests of All-Russia Flax Institute (2002-2004) on combination of Albit and fungicidal seed treatment agents, Albit combined with 50 or 30% decreased application rates of fungicides (based on a.i. carboxin and thiram) provided effective protection against anthracnose, bacterial disease and mottle with efficiency of full doses of chemicals or even higher (BE 84-97%). In field trials (2003), BE of fungicide (a.i. thiram + tebuconazole, 1.5 kg/t) against anthracnose was the same as that of fungicide (a.i. thiram + tebuconazole,1 kg/t + Albit), whereas joint using of fungicide (a.i. thiram) and Albit increased BE of fungicide (a.i. thiram) against anthracnose from 68.2 to 90.9%. The analogous effect was observed in case of mottle. 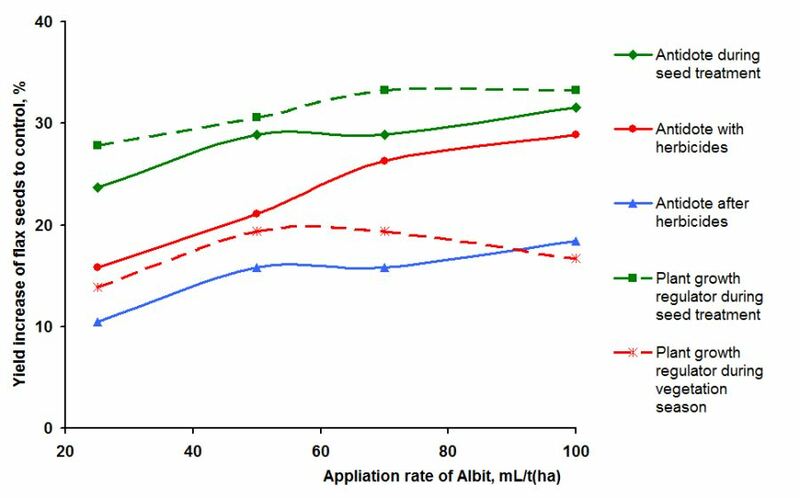 Decrease of application dose accompanied with addition of Albit increase effectiveness of fungicide (a.i. thiram + tebuconazole) and fungicide (a.i. thiram) from 88.2 to 94.1% and from 52.9 to 82.4%, respectively. 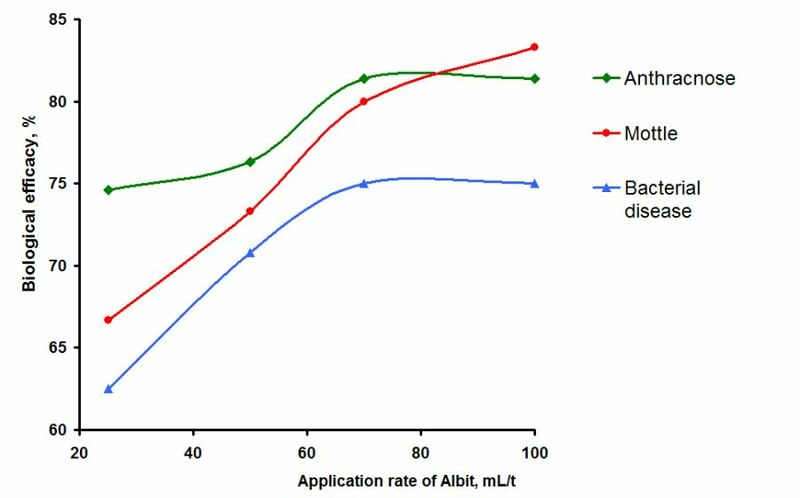 The most pronounced fungicide-activated action of Albit was observed in treatment against bacterial disease: Albit increase BE of fungicide (a.i. thiram + tebuconazole) and fungicide (a.i. thiram) more than twice, from 44 to 96%, and from 40 to 84%, respectively. Influence of Albit/fungicide (based on a.i. carboxin + thiram) combination on flax diseases and yield increases, All-Russia Flax Institute, 2002-2003. Comparing to purely fungicidal treatment, Albit also increased flax straw yield by 0.2-0.4 t/ha centners/hectare, and seed yield by 0.04-0.12 t/ha. In trials of 2004 the regularity of Albit influence found in 2002-2003 was confirmed. Prevalence of anthracnose, mottle and bacterial disease in control was 10.5, 19 and 12.5%, respectively. Effectiveness of seed treatment with fungicide (a.i. thiram + carboxin) and halved dose of fungicide (a.i. thiram + carboxin) + Albit against anthracnose and mottle was the same (92-97%), whereas effectiveness against bacterial disease was almost twice increased by addition of Albit. Similarly, yield increase rise up from 14% to 31% over untreated control. Combination with Albit increases average number of long fiber (parameter of flax fiber quality) by 11 units over untreated and fungicide-only treated controls (a.i. of fungicide – thiram + carboxin). Also, fungicide (a.i. thiram + carboxin) in combination with Albit increased flax fiber percent-number by 65% over control; fungicide (a.i. thiram + carboxin) only treatment increased this parameter only by 26% over control. The highest economical efficiency also was detected in variant of halved dose of chemical protectant + Albit. Net profit in this case was 3180 roubles/hectare, whereas pure tiram and carboxin based fungicide brought only 1425 roubles/hectare, i.e. more than twice less. Presowing seed treatment makes 50-60% of total Albit effect, the rest can be reached through foliar spraying. Foliar spraying with Albit in stage of ‘firtree’ consolidates and reinforces stimulating influence of seed treatment, protects plants from pasmo disease, provides high yield (Fig. 2) and improves flax fiber quality. As is known, successful cultivation of flax without herbicides is impossible. However, using of herbicides is also stressful for flax, and leads to whitening, wilt, growth delay, decrease of fiber quality and general productivity. Application of Albit together with herbicides or several days after herbicidal treatment is extremely effective for relieving of herbicidal stress due to Albit antidote activity; it can radically correct the situation (Fig. 3). In field trial of All-Russia Flax Institute in 2003, the influence of combined using of Albit and herbicides on the growth of flax var. A-93 was studied. Before sowing, seeds were treated with different pesticides (a.i. thiram + carboxin), Albit, Albit/a.i. thiram + carboxin combination. Independently on mode of presowing treatment, all plants in ‘firtree’ stage were sprayed with herbicide mix (a.i. chlorsulfuron potassium salt, 0,005 kg/ha) + a.i. quizalofop-P-tefuryl, 1 kg/ha) and with the same herbicides + 50 mL/ha of Albit. In all variants where Albit was used, flax productivity was considerably (by 0.4-0.6 t/ha) higher than in variants without Albit. This regularity was confirmed in experiments of All-Russia Flax Institute in 2004, when mix of herbicides (a.i. chlorsulfuron potassium salt and a.i. chisalofop-P-ethyl, 0.005 kg+1.5 L/ha, respectively) was used for herbicidal treatment. Addition of Albit to this pesticides increased yield of flax straw averagely by 0.3-0.6 t/ha. Also, it was found that using of Albit abolished delay in alternation of flax growth stages inflicted by herbicides (Fig. 3). For example, Albit-treated flax was actively blossoming by 8 of July, whereas untreated one exhibited only the very first flowers (Fig. 4). 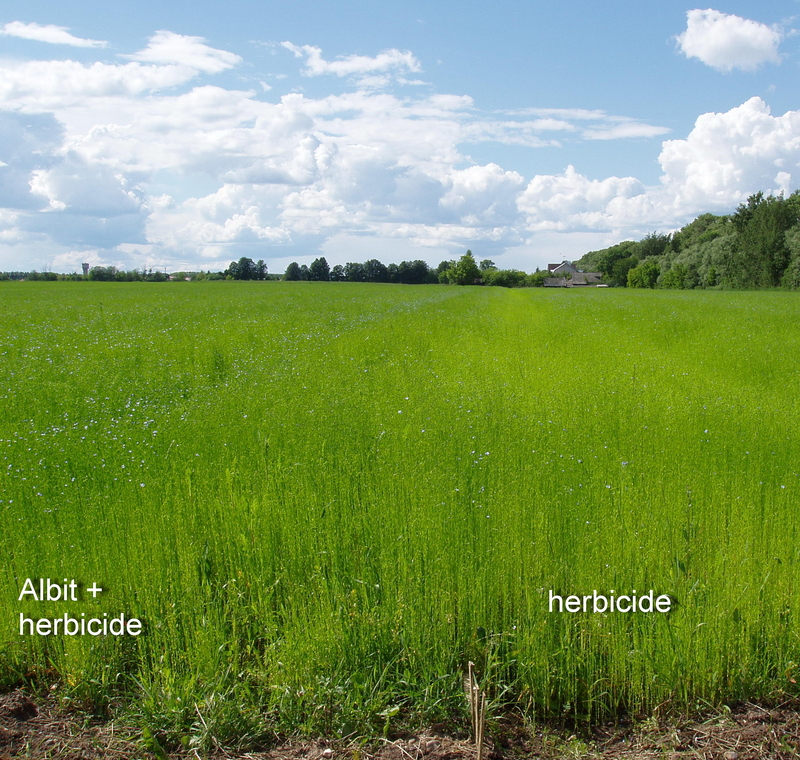 Analogously, Albit is effective in combination with insecticides against flax moth, large flax flea beetle, tripses; it recovers plant immunity decreased by herbicidal and insecticidal treatments. Albit treatment is sufficient for reliable immunization of flax plants against pasmo disease, but in case of high infectious environment one can recommend to use Albit with halved dose of chemical fungicide (for example, fungicide based on a.i. Benomil). The high antistress and growth stimulating activity of Albit is the reason for wide application of this product for treatment of flax. Albit has been used by the biggest flax growing company of Russia, Bijskaja l’njanaja kompanija (Bijsk flax company) of Altaj kraj, as well as in many flax growing companies of Russian North. In Nizhnij Novgorod region and in Stavropol’ kraj Albit is also successfully used for increase of productivity of curly flax (Fig. 5). In the All-Russia Flax Institute (Torzhok, Tver' oblast, 2006-2009) Albit was applied on sowings of fiber flax (var. А-93 and Tverskoj). It was shown that biostimulant increased of flax resistance to pests. Biological efficacy of Albit against flax flea beetles average was 21.1%. The obtained data indicates on positive influence of Albit, consisting in immunization and accelerating of plant restoration after damages by pests. 1 litre of Albit provides average yield increase of 65 centners of flax straw and 11 centners of flax seeds.